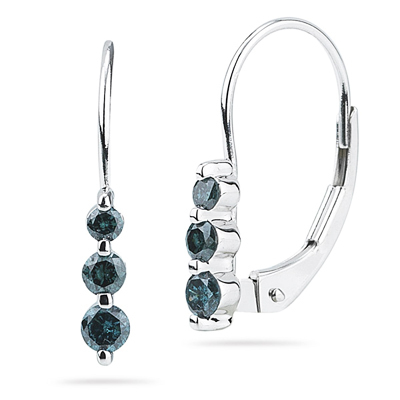 0.25 Cts Teal Blue Diamond Three Stone Earrings in 14K White Gold . These delightful Teal Blue Diamond Three Stone Earrings flaunt three glamorous Blue Diamonds each prong set in 14K White Gold. Approximate Blue Diamond Weight: 0.25 Carats. A spectacular way to add a touch of color. You save an additional: 332.65!